LAS VEGAS, NV--(Marketwired - Oct 7, 2013) - Findly, the on demand talent market leader and a Symphony Technology Group (STG) company, accepted a Top HR Product of 2013 Award by Human Resource Executive® magazine during a special luncheon today at the 16th Annual HR Technology Conference & Expo. 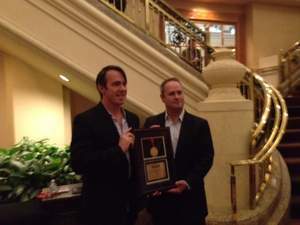 Accepting the award on behalf of Findly for their Swarm solution was company founder and CTO, Jason Kerr. Swarm received top scores for delivering an enhanced referral recruiting process that engages employees as the top source of qualified candidates. 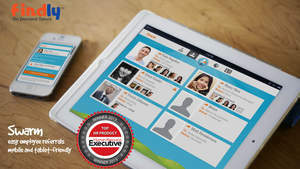 In making their selections, the editors of Human Resource Executive evaluated many HR products released in 2013, based on ease of use, level of innovation and value they bring to the HR profession. Swarm was chosen for revolutionizing the recruiting process through a groundbreaking technology platform that makes employee referrals more engaging, reduces recruiting costs and results in more qualified hires. By integrating social media and gamification, Swarm transforms the referral program into a collaborative social activity that encourages employee engagement. Moreover, with a fully transparent process that protects the relationship between employees and their referrals, Swarm helps to spur executive participation -- a key factor in the success of any referral program. "I am delighted to accept this honor on behalf of the entire Findly team, who worked tirelessly on the development of Swarm to make it such a success," said Jason Kerr, founder and CTO of Findly. "Our goal is to redefine the recruiting industry through innovative technology solutions that connect employers with the talent they need. Receiving this distinguished award under such fiercely competitive circumstances further validates our ability to meet this objective." Attendees of the HR Technology Conference & Expo can learn more about the award-winning Swarm, and Findly's entire suite of on demand talent acquisition solutions, at Booth No. 127 during the conference's exposition, which is being held Monday, October 7 and Tuesday, October 8, 2013. Findly founder and CTO Jason Kerr (left) and CEO Jeff Russakow (right), accept Top HR Product of 2013 Award.